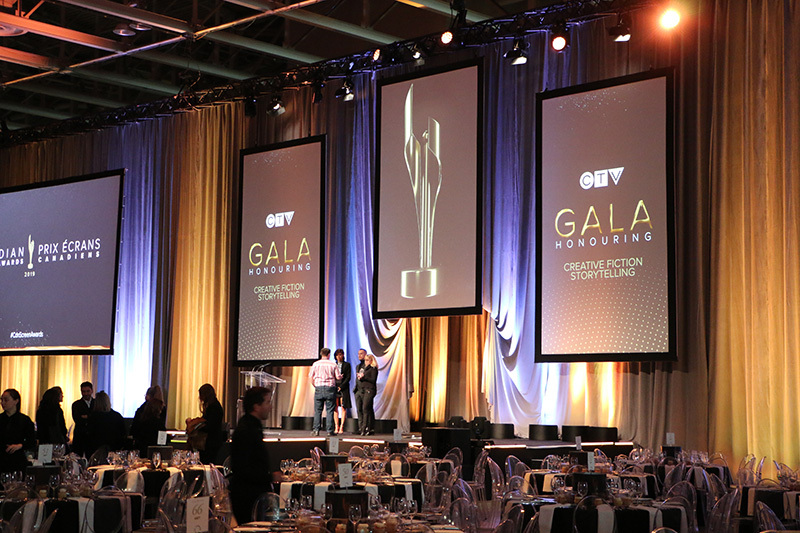 (March 28, 2019 – Toronto, ON) Last night was the 2nd round of awards handed out each year by the Canadian Academy of Cinema and Television. There was an uptick in the glitz and glamour over Night One, where the news and information people dressed in a more serious manner befitting the work they do on a daily basis. Last night there seemed to be more fun, more daring in the choices made for what to wear. I won’t mention any names, but more than one person kept checking their dress as it seemed gravity had other ideas. This season of the mini-series Cardinal, actually called the Blackfly Season, walked off with awards for Best Limited Series or Program and picked up four more awards, including Best Writing, Drama Program or Limited Series for Sarah Dodd, Best Direction, Drama Program or Limited Series for Jeff Renfroe, Best Picture Editing, Drama for Matthew Anas, and Todor Kobakov won for Best Original Music, Fiction. 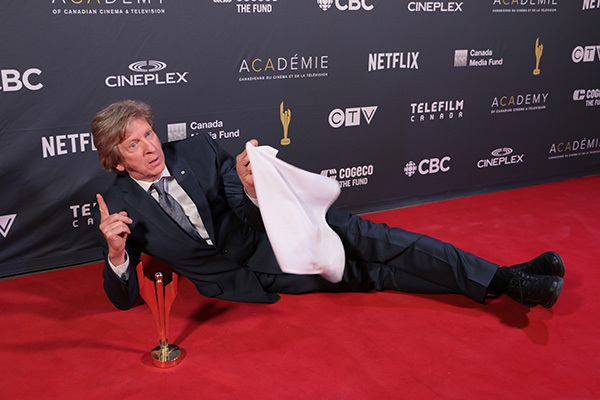 R.H. Tomson celebrates his win at the 2019 Canadian Screen Awards. 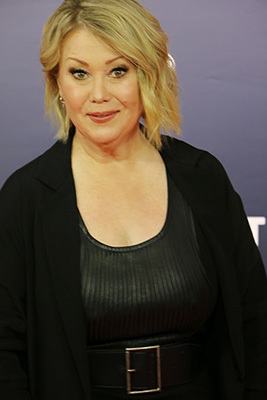 CBC’s Anne with an E took a Best Supporting Actor award for Drama for the always on R.H. Thomson, as well as a Best Supporting Actress, Drama for Geraldine James. Schitt’s Creek received the Canadian Screen Award for Best Supporting or Guest Actor, Comedy for Noah Reid and Best Supporting or Guest Actress, Comedy went to Emily Hampshire. 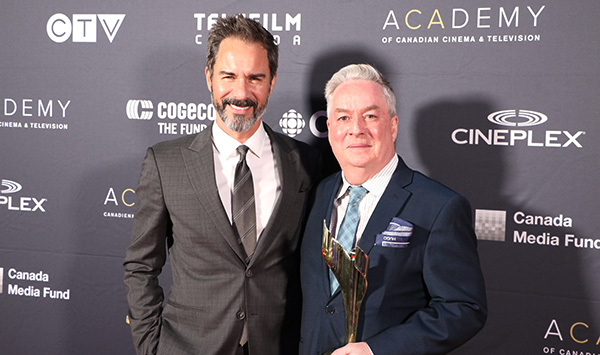 Eric McCormack and Brad Wright at the 2019 Canadian Screen Awards. There were some special moments last night including a very touching part of the ceremony when Martin Katz and Lisa Meeches presented the Academy Board of Directors’ Tribute to Carole Vivier, CEO & Film Commissioner for Manitoba Film & Music. Eric McCormack presented producer and screenwriter Brad Wright with the Margaret Collier Award. 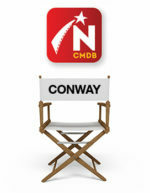 The full list of nominees and winners is available online.